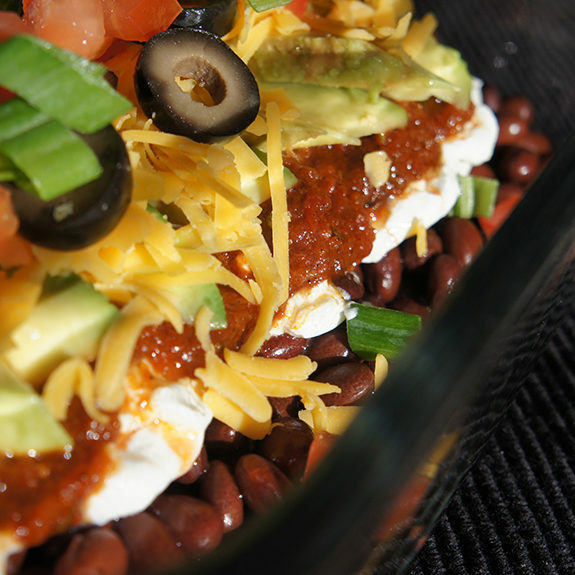 Larry’s All Natural Chipotle or Ranchero Sauce adds the special Mexican flavor to this taco dip. It takes minutes to assemble and is sure to be a favorite at any party. Spread the beans in the bottom of a 9" square or 10" round serving dish. Spread the cream cheese over the beans. Spread a generaous layer of Larry's All Natural Chipotle or Ranchero Sauce over the sour cream. Layer the avocado slices over the sauce and sprinkle with the lime or lemon juice to prevent the avacado from turning brown. Cover the avacado with a shredded cheese, then sprinkle the green onions, diced tomato, and black olives over the cheese. Serve with tortilla chips.